Grab Green Natural 3-in-1 Laundry Detergent is one of the most transparent products I have reviewed here. This is because on their website and even on the back of their bags, they list each ingredient and tell you why and the source as well. Not many companies are that confident to do that. This product currently has a 4.3 star rating on Amazon, and carries the "Amazon's Choice" badge. But even though they are transparent about their ingredients, are they quality ingredients? From first glace, this definitely looks like a trustworthy brand. It is not overpriced, very honest about their ingredients, even though not all are natural, however they do avoid using any harsh chemicals or known carcinogens. The 3 in 1 label is a bit confusing, though. Usually when you see 3 in 1 or 2 in 1, that means it does more than other products. And that is somewhat true for Grab Green Natural 3-in-1 Laundry Detergent. Their claim is that this product offers superior cleaning power, removes stains, and brightens clothes. For detergent, that is not really a 3 in 1 type of thing. That is what detergents should already be doing, and you should not have to buy extra products to get those results. So while, technically I guess the 3 in 1 thing is true, it still just sounds like a marketing gimmick. The best quality of Grab Green Natural 3-in-1 Laundry Detergent is that they are super transparent about their ingredients. While the majority of them are in fact natural and naturally sourced, there are a few that are chemicals. However, they do avoid any use of phosphates, chlorine, dyes, and other harsh chemicals. The key ingredients are variations of sodium, including carbonate, peroxide, citrate, silicate, and salt. Now the rest of the ingredients featured are a combination of natural and chemical, but there are no harsh or potentially harmful chemicals listed. Even the fragrance, which in this case is Waterlily, is mostly essential oils, with trace amounts of safe synthetic fragrances. While a scent is not particularly needed when it comes to laundry detergents, it is definitely welcome. Many people believe that if your clothes do not come out smelling like flowers or citrus, that means they are not clean. This is not true in the least, but because it has been ingrained in our minds for so long, it is still a good idea to use a fragrance in your detergent, from a business standpoint. So, Grab Green Natural 3-in-1 Laundry Detergent does include a scent, and a fairly strong one at that. When it comes to buying detergent, Grab Green Natural 3-in-1 Laundry Detergentis about as cheap of a natural detergent as you are going to be able to find. The reason it is so cheap is that you barely need any of it for a large load of laundry. Using one tablespoon of Grab Green Natural 3-in-1 Laundry Detergent is most likely going to be enough. On smaller loads, you can even useless. This translates into using cents per load. Grab Green Natural 3-in-1 Laundry Detergent is designed to get the cleanest clothes possible with having the smallest impact on the environment. They have done a great job by keeping it all natural, but this does have a very strong scent to it. I think that is the biggest complaint I have seen about this product. But this detergent is great for the environment and it really cleans your clothes instead of masking the scent. Grab Green was started by two parents who found that they had a common interest. Patricia Spencer, and Michael Edell became partners and started Grab Green in an effort to make a complete line of eco-responsible cleaning products and set out to change the way you think about "natural" cleaning. Grab Green was among the first to offer pod based detergents, as well as list every ingredient on the label. Now, their product line is quite expansive, offering cleaning products from laundry, all the way to room fresheners. Each of them made with the same dedication and quality ingredients as the one we are reviewing today. 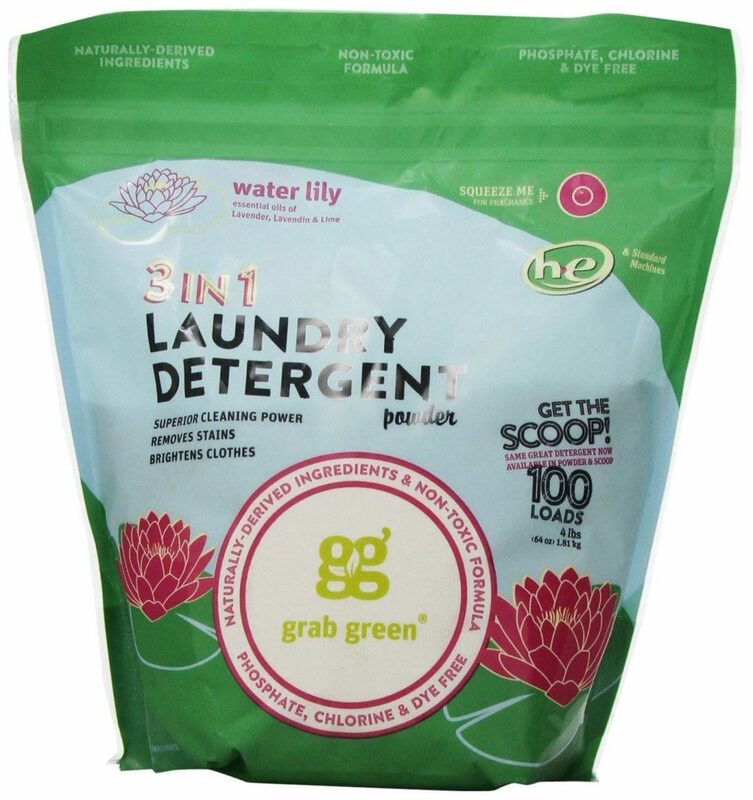 Grab Green Natural 3-in-1 Laundry Detergent is natural and biodegradable. When you use Grab Green, you won’t be adding harmful chemicals to the environment or your septic tank. If you are looking for a trustworthy brand with nothing to hide, look no further than Grab Green Natural 3-in-1 Laundry Detergent. All of their ingredients are listed, as well as their roles and sources. Grab Green Natural 3-in-1 Laundry Detergent has a fairly strong scent that not everyone may like. The strong scent of Grab Green Natural 3-in-1 Laundry Detergent may be a real deal breaker for some people. However, if you are not the kind that likes scents, there is a fragrance free option that you can use instead of this one. It is just as effective as their waterlily scented detergent, but contains none of the scents or synthetic fragrances. But nevertheless, Grab Green Natural 3-in-1 Laundry Detergent is a really great and trustworthy brand, not to mention effective. Just may be exactly what you are looking for. Overall, Grab Green Natural 3-in-1 Laundry Detergent is a great brand that gets the job done without any harsh or toxic chemicals you have to worry about. While the scent is rather strong, some may not mind it as much as others. If you want to give this product a try for yourself, you can grab a bag on Amazon for $17.99. For more information, including the best natural laundry detergent, check out the rest of Green and Growing. Here are some top questions that I found for people seriously considering buying the Grab Green Natural 3-in-1 Laundry Detergent Powder. Is Grab Green owned by a parent company? No, they are privately owned. Is Grab Green cruelty free? Yes, none of their products have ever been tested on animals.